World War II helped to define Tristan Jones as an adventurous Welsh youth. After losing his parents, he spent much of his life working on sailing barges and so he is no stranger to the seas when he’s called to fight for Britain during the Blitz in 1940. Tristan Jones is not only caught in the middle of arduous battles on board, but also the tragic battles he must fight in his heart. When the British Royal Navy commissions him to embark on transatlantic duties on the HMS Eclectic, HMS Hood and the Bismarck, Jones learns the emotional trials a sailor must face. 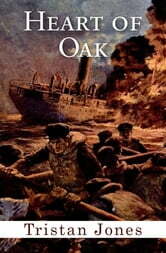 On land and at sea, Jones is a hero and describes his thrilling and often comic adventures in HEART OF OAK. The Oak Island Mystery, Solved!